Vitamin C is one of the most widely recognized and used anti-oxidants in the world. This anti-oxidant plays a critical role in helping the immune system, joints and arteries heal and function properly. Coyne Healthcare’s Liposomal vitamin C® is a technological breakthrough in nutrient assimilation and offers incredible health benefits. Coyne Healthcare’s Liposomal Vitamin C® is based on a patented extract technologywhich encapsulates the Vitamin C molecules in liposomes made from Essential Phospholipids, which protect the vitamin C from destruction in the digestive system. Within minutes of taking Liposomal Vitamin C®, liposomes filled with vitamin C are transported into your bloodstream, and into your cells. Liposome technology contains Phosphatidylcholine which is good for the liver! With Coyne Healthcare’s Liposomal Vitamin C®, your body receives essential phospholipids with the vitamin C delivering a powerful “1-2 punch”. So not only do you get all the benefits of vitamin C, but you also help satisfy the body’s ever-growing need for essential phospholipids including Phosphatidylcholine (PC). PC is one of the most important phospholipids required for many vital functions in maintaining a healthy cardiovascular, reproductive, immune, and nervous system. This liposome encapsulated form of vitamin C is the first choice of people who really understand bioavailability and the importance of high-dose vitamin C. Other forms of vitamin C succumb to absorption barriers that vastly limit the level of vitamin C that can enter the bloodstream. Coyne Healthcare’s LIPOSOMAL Vitamin C®crashes through these barriers to get high potency vitamin C where you need it most, your cells. Suitable for diabetics and vegetarians. Contains no sugar, soya, gluten, artificial additives or preservatives, GMO free. Take 1 to 2 capsules per day or as recommended by a healthcare practitioner. 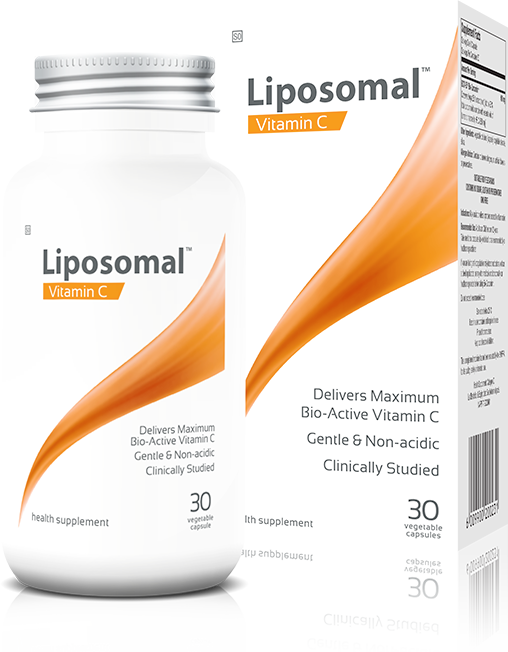 If you are using medication to lower blood pressure or have a bleeding disorder consult your healthcare professional before using Liposomal Vitamin C®. Use within 90 days of opening. Store in cool, dry environment and avoid exposure to light. Keep out of reach of children.